Aichi E16A1 Zuiun ("Auspicious Cloud") "Paul"
Dimensions 42'0" by 35'7" by 15'9"
Power plant One 1300 hp (970 kW) Mitsubishi MK8A Kinsei 51 14-cylinder air-cooled radial engine driving a three-blade constant-speed metal propeller. Production A total of 256 E16As were built. Late production aircraft were powered by the 1300 hp (970 kW) MK8D Kinsei 54. This engine differed little from the Kinsei 51 in performance. 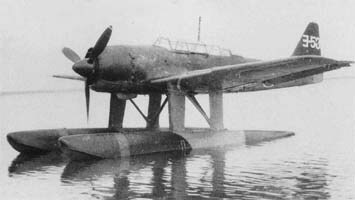 "Paul" was the replacement for the E13A "Jake" but did not come into service before the Japanese had lost control of the air. Requirements were first drafted in 1939, before "Jake" had even come into full production, but disagreements over the requirements prevented serious design work until October 1940, when a team lead by Matsuo Kishiro and Ozawa Yasushiro began drafting the new design. The prototype was completed in May 1942 and was of all-metal construction except for wingtips, tailplane and some control surfaces. The wings could be folded for storage. The type went into production in August 1943. "Paul" suffered heavy losses in the Philippines, and most of the survivors were expended as kamikazes in the Okinawa campaign. Oddly enough, it was designed to be capable of dive bombing, being equipped with dive brakes on the forward float struts.